We'll stand in front of your DDOS attacks up to 500Gbps, no matter the duration of the attack. We have scrubbing centers in France, Germany, the United Kingdom, and in several states in the United States. No matter your server's location, we're there to protect it. 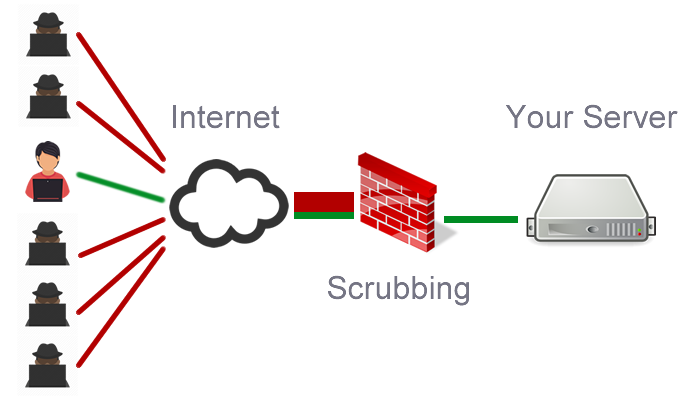 Each scrubbing location has failover redundancy with automatic nullrouting capabilities, so if one user is hit too hard, they can be severed from the network before it impacts any other customer. As a first line of defense, all of our hosted websites leverage Cloudflare services for security and malicious mitigation to include Scripted Attacks, Bot Attacks, Brute Force Attacks, and DDOS Attacks. Cloudflare has one of the largest IT infrastructures in the world and attacking one website means not being able to view or attack any website leveraging Cloudflare protections. We have infrastructure in 2 scrubbing facilities located in Michigan and Florida. Both facilities are capable of neutralizing a 800Gbps DDOS attack by filtering out malicious packets. We also have servers as primaries and mirrors located in each facility as well. The scrubbers can dynamically switch traffic over a GreTunnel from facility to facility in the case of failure or saturation. With Always-On Technology, even if a server is offline, Cloudflare will continue to serve cached snapshots of your website until it comes back online. This means we can guarantee 100% website availability because the little maintenance we do perform, Cloudflare will make it virtually unnoticeable. Using historical data, we can see an attack inbound before it can cause havoc and damage. Our detection algorithms, with a year of maturation, has proven to be invaluable in helping us to identify and stop attacks, before they happen!